Rolo cookies, a flashback from the 1980's but still just as delicious today! Preheat your oven to 375°F. In a medium bowl, whisk flour, cocoa, baking soda and salt together completely. Set aside. In a large mixer bowl with your paddle attachment, beat the sugars & butter until light & fluffy. Add in the eggs. Beat well, then add in the vanilla. Add the flour mixture slowly and blend well. 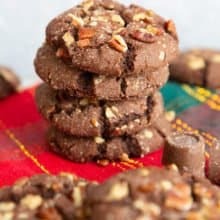 Combine pecans & remaining sugar in a small bowl..
Wrap about 2 tablespoons of cookie dough completely around 1 Rolo candy. Roll the cookie ball in the pecan mixture. Place on parchment paper lined cookie sheet at least 1.5 inches apart..
Bake 14-16 minutes at 375 degrees F.
Cool on tray for at least 5 minutes so the Rolo inside the cookie sets a bit. Move to cooling rack and cook completely.